Greetings everyone! After a few months of hiatus and several sleepless nights, Turbine is now released! 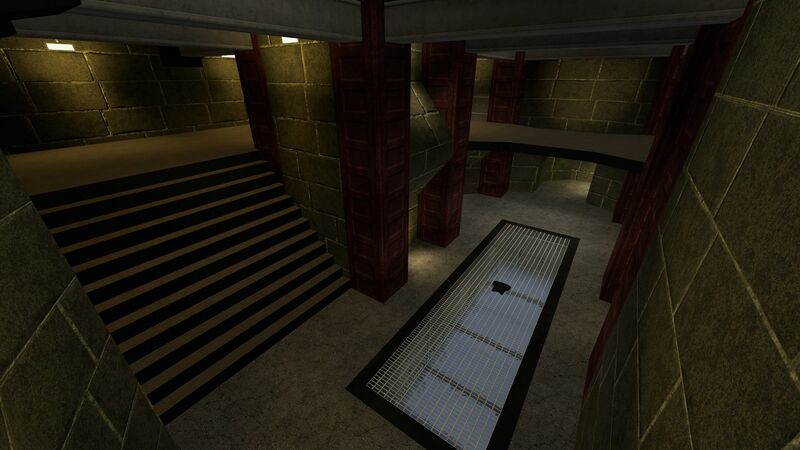 Turbine is a complete conversion from Unreal Tournament 99 to Goldeneye Source, created from scratch in Hammer. Like my other map from Unreal Tournament Codex, I've used the original map in UnrealEd as a reference to achieve the highest possible accuracy in brushwork, lighting and overall detail. Whilst there are obvious changes such as weapon/armor placement and the engine differences, the core map is the same and I tried to recreate the original feel as much as possible, whilst drifting away from the much darker lighting the original map had for obvious reasons. I've included a .res file for server owners, although I did not test it, it should work without problems. Should it have any problems, please contact me and I'll see what I can do to fix it. I would like to sincerely thank everyone who helped me in the making and testing of this map, and I would also like to thank everyone who showed interest in this map! Without futher ado, happy fragging! Thanks for the kind words Helios, I'm glad you're having a good time with the map! Thanks Adrian, always a pleasure!